Which number resonates with you best? Which quote do you relate to most? Intimidation didn't really exist if you're in the right frame of mind." If you’re going to be a leader, you’re not going to please everybody. You’ve got to hold people accountable. Even if you have that moment of being uncomfortable. "I close my eyes and just reminisce. That's what keeps me sane." How would your teammates describe you as a leader? Which Marvel character do you most relate to? What type of personality do you best partner up with? Which rap quote about Kobe do you like best? This leader is is brash and sometimes a lot to deal with. You're confident and sometime people mistakenly look at you as being cocky. You have high levels of energy and are excited by challenges. Like Kobe after shooting an airball as a rookie in a playoff game, your work ethic and exuberance will help you recover from defeats. Young Kobe needed to check his ego at the door a few times but the talent was always there. He often had to walk that arrogance versus confident line. You're a leader who works well with others and are team oriented. You pay attention to detail and consistently seek diverse ways to lead. This might have been the best and most effective Kobe. When he changed his jersey number, it marked a new level of focus. He won titles as the main leader as opposed to sharing the shine with Shaq. You are the Black Mamba. When a decision needs to be made. You'll make it, even if that means alienating others. This leader has some autocratic leadership traits. They rarely take ideas of others in consideration. Kobe was always very competitive but when he started going by the name Black Mamba, it was time to be ruthless. He called out teammates and aggressively took matters into his own hands, often disregarding the feelings of others. With all that said his determination was unmatched. This is a veteran leader. You lead using your words and input more than your actions. Gratitude is a strong quality of yours. You're patient and a mentor, although you don't always relate. Kobe had been his most sage during his last few years. He's been great around the younger players on his team and around the league. From Kevin Durant to Anthony Davis so many young stars have labeled Kobe as a mentor. Kobe Bryant will go down as one of the greatest basketball players of all time. Throughout his career he exhibited varied levels of leadership. 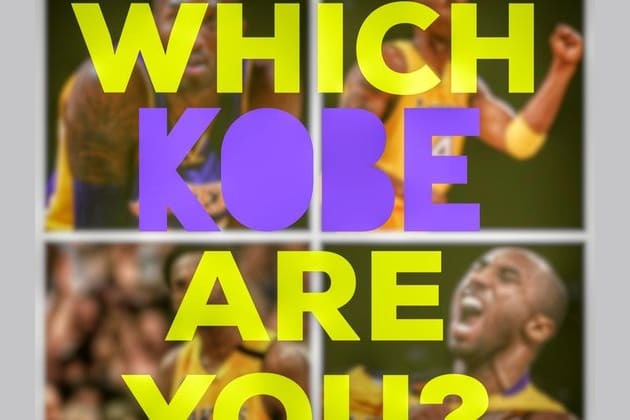 Take the quiz and find out which type of "Kobe Leader" you are!